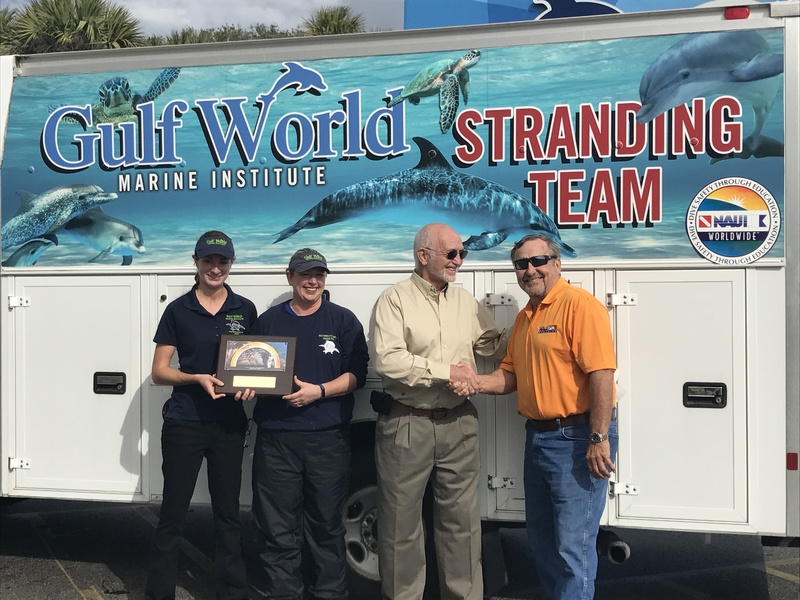 Gulf World Marine Institute officially receives National Association of Underwater Instructors (NAUI Worldwide) Environmental Enrichment Award. Danny Grizzard, local long time SCUBA instructor and boat captain, graciously accepted the award on GWMI’s behalf at the NAUI awards ceremony and is proud to be presenting the award to Ron Hardy, President of Gulf World Marine Institute. “I have watched the work of Gulf World for many years and am proud of the work that they have done and continue to do to help the aquatic environment and the animals that call it home. I nominated Gulf World for this award and I was very proud for them to be chosen.” Captain Danny Grizzard. “For decades if not generations, humans have consumed the natural resources of our planet in the name of progress. Of particular concern to the diving community is the continuing damage to our aquatic environments and the fear that marine ecosystems will lose their ability to regenerate.” NAUI Worldwide. NAUI’s Environmental Enrichment Award is given for “work causing or promoting improvement or protection of the aquatic environment.” Gulf World has been involved in the rescue, rehabilitation and release of sea turtles and marine mammals since the 1970’s. In 2012, the 501c3 non-profit organization, Gulf World Marine Institute was formed. “We feel incredibly honored to receive this prestigious award from NAUI which is recognized world-wide for their wonderful work.” Ron Hardy, President of Gulf World Marine Institute.